Going to wild places with Sierra Designs Flashlight 1 Tent. When solo camping, I prioritize light weight. For the past couple of years, though, I have compromised on weight by bringing a two-person tent. With most one-person tents, I find myself struggling to sit up even half way comfortably. Sierra Designs has addressed that compromise backpackers oftentimes make with the innovative design of the Sierra Designs Flashlight 1 tent. 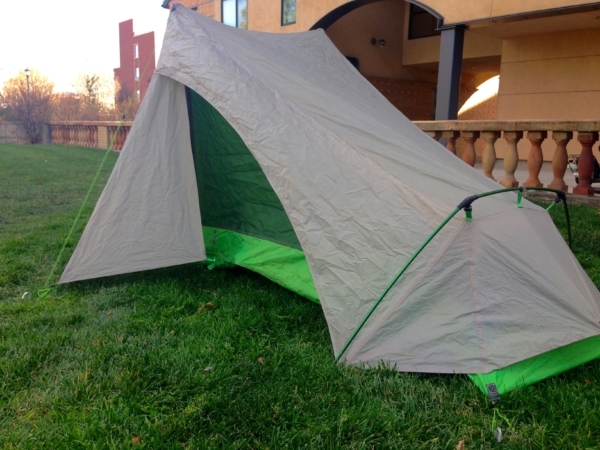 The Sierra Designs Flashlight 1 Tent is as unique in design as tents get. It has a rectangular base with a diagonally-sloping top. At its peak, the tent stands at 45 inches tall, allowing for ample room to sit up in that half of the tent. The tent has one door and 3.5 ft2 vestibule. There are three poles, one for the door, one for the ventilation window, and one for the footbed. Five guylines situated at the front, rear, and sides of the tent keep the tent erect and taut. The tent is single-walled, so the rainfly is built into the frame of the tent. Combined with the Polyester Tafetta fly fabric and 20D Nylon body fabric, the materials are quintessential ultralight. 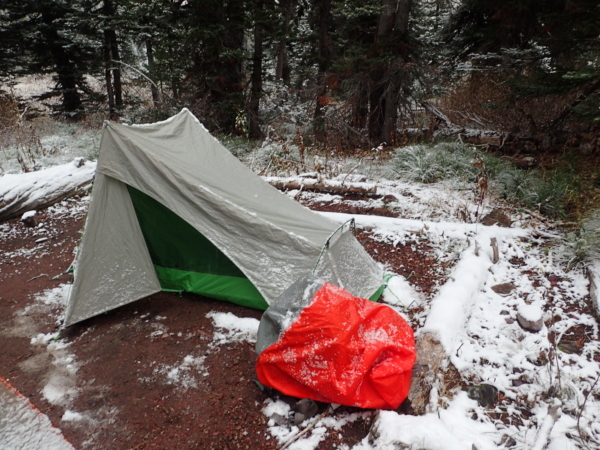 The Sierra Designs Flashlight 1-Person Tent accompanied me during two trips. The first was an overnight, car-camping trip in Pike’s Peak National Forest, Colo., in mid-September, and the other was a 13-day backpacking trip in Glacier National Park at the end of September through mid-October. As is custom to September in Colorado, the weather during the first test was dry with low temperatures around 45 degrees. During the second test, the weather varied from a dry 45 degrees, a snowy 10 degrees, and a rainy 50 degrees. The Sierra Design Flashlight 1 is highly packable leaving you space for the other essentials. During my first test of the tent and the dry days in Glacier National Park, I experienced little to no condensation on the inside of the tent. In Colorado, this is normal with any tent because of the aridity of the air, but I was pleasantly surprised in Glacier National Park. When the humidity increased, the inevitable ventilation disadvantage of a single walled tent was on full display, and the walls were coated with dew. That being said, when I took out the tent that night to set it up at our next campsite, the condensation had not saturated the tent even though I packed up the tent without having fully dried it. Even though the non-freestanding design of the Flashlight decreases its overall weight, it also restricts the type of surface on which the Flashlight can be used: without a surface in which stakes can be hammered in, this tent will not work. Additionally, the ability to make the tent taut depends heavily on how well suited the ground is for stakes. In areas that had very silty or shallow soil, the pull of the guylines coming down from the apex of the tent would either dislodge the stake from the ground or compromise the tautness of the entire tent. Although the guylines work sufficiently in fair weather, rain or snow more easily pooled at areas where the tent had begun to sag. The vestibule is also very small. Neither my 75 L pack nor my 45 L pack could fit in the vestibule without leaning on the vestibule or tent doors. Although I left my pack outside the vestibule with a pack cover on and my belongings in trash bags, this was not ideal when inclement weather hit. Sierra Designs Flashlight 1 Tent tested in unexpected snow. The other issue with the Flashlight 1’s non-freestanding design is that it made it difficult to set up alone, which, for a 1-person tent, is a problem. I found myself trying to hold up one of the tent poles at the apex while trying to stake in its corresponding cord. Oftentimes, I would have to re-stake the corners or change the tautness of the top guylines after finishing the initial set up. The inclusion of the 5 guylines does make adjustment substantially faster and more precise. The Flashlight 1 tent is perfect for lightweight trips in dry areas. As someone living in Colorado, I would use this on any late spring, summer, and early fall trip, even if light flurries were in the forecast. 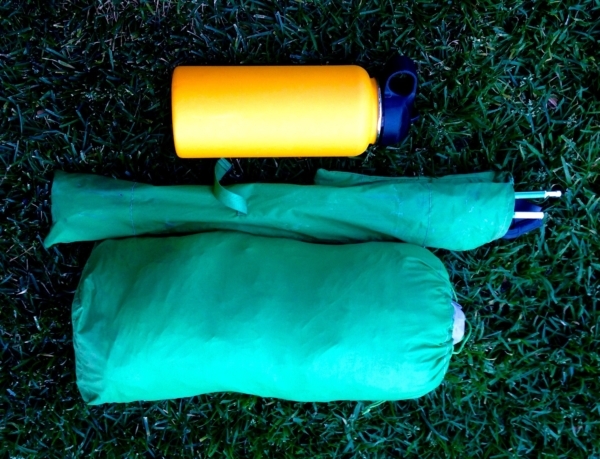 It is light, packable, and durable enough to handle any length or trip intensity. The tent is not suitable, though, for wet trips because of limited vestibule space and poor ventilation. Additionally, the tent cannot be set up in places without ground suitable for stakes or populated with heavy rocks or logs to tie-off to. The only other consideration when buying this tent is about height. I am 5’ 6” and fit comfortably in this tent. 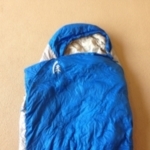 My partners on the Glacier Trip are both 6’2” males and did not fit comfortably, especially when there was a lot condensation at the front and rear of the tent.